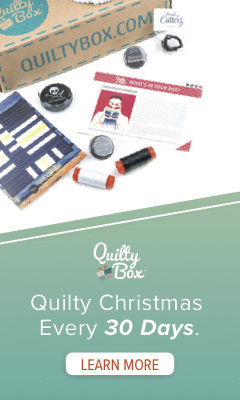 First I want to start out this post by announcing the winner of my first round of prizes from this post AND THE WINNER IS …..
one of the quilt patterns above look like mail slots and the border surrounding looks like ribbon weaving in and out. such talent, such creativity. Susan will have coming her way next week, and I would love to send another one away. And don’t forget there is still a different prize to give away at THIS post….LOTS of giveaways here peeps…share the news cause sometimes, there will be a certain number of comments required to give any of it away! Now on to more quilt market photos….again no particular order on these, and if you are really bored with these, you can scroll down to the end where the prize for this post is waiting. 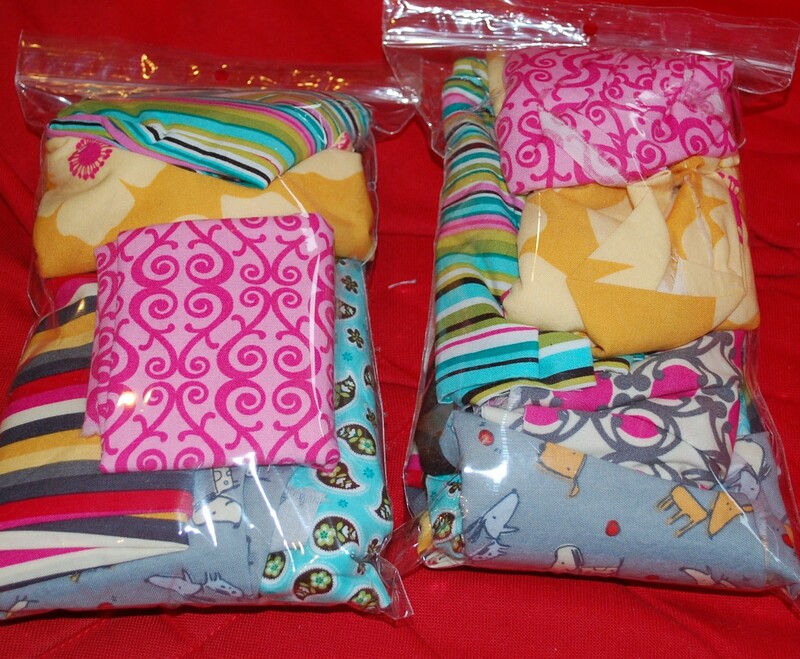 Patricia Bravo at Art Gallery Fabrics….wonderful stuff! With yummy new things coming up! Here is Bonnie and Camille’s newest stuff….love the red and aqua combo’s!! 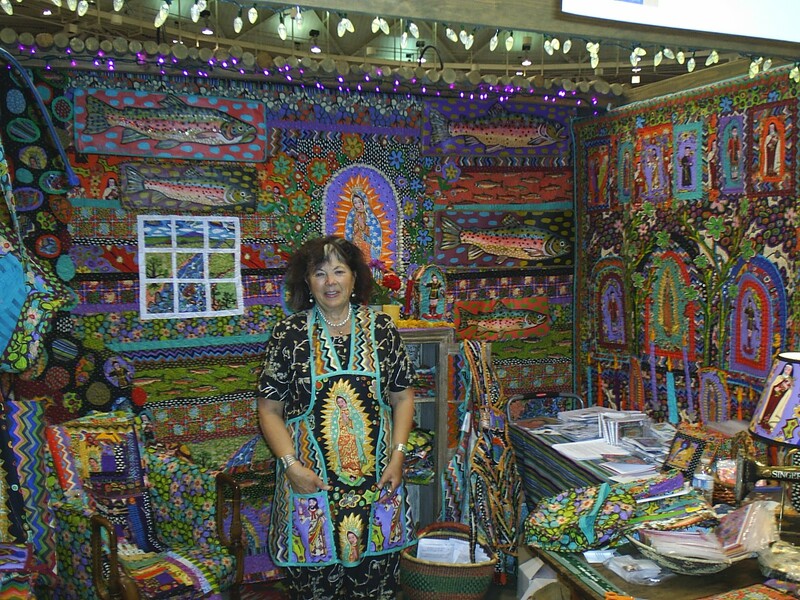 And then something completely different —- Terrie Mangat and her booth…just love the riot of color here!! super nice lady! I missed the class she had been teaching that I had hoped to get in on, and she gave me the pattern and some hints and a few supplies..I will show you when I make it…it is somewhat of a soft sculpture project….She has another colorful line coming out this fall with Bees!! I love me some bees…especially non-stinging fabricy type bees! Of course I was delighted to see my quilt so prominently displayed at the Robert Kaufman booth…and I HAD to take a picture, didn’t I? Okay now for today’s prizes…..yes, I said prizes….I have multiple…. One of these: with surprises inside…. So you know the drill by now…comment here on THIS post about whatever you like best on this post….and when I get to 25 comments I will start drawing. for the above prizes…..I have a goal here people…and it really isn’t too big of one I don’t think….cause I just love giving stuff away…and these were all given to me to do just that so they are here for the taking…I mean I could keep them I suppose, but I want to share …..
Don’t forget to keep checking the past couple posts too and the next ones coming up…I have a great little package that Valori Wells gave me, and some Anna Maria gift packs, some other doodads, and even a book giveaway coming up as well…so stay tuned…okay?? And if I am really boring you already PLEASE tell me….I will move on with things here…. I really had a great time at Quilt Market, can you tell….tomorrow I have to go back to the Day Job….sigh…don’t think it will be nearly as thrilling for me…just more of the same…but don’t get me wrong. I am very happy to have a Day Job that can help pay for things for now…these quilting career goals of mine don’t just happen overnight. They take time….thanks for hanging out with me, while things unfold. I really appreciate your visits….. 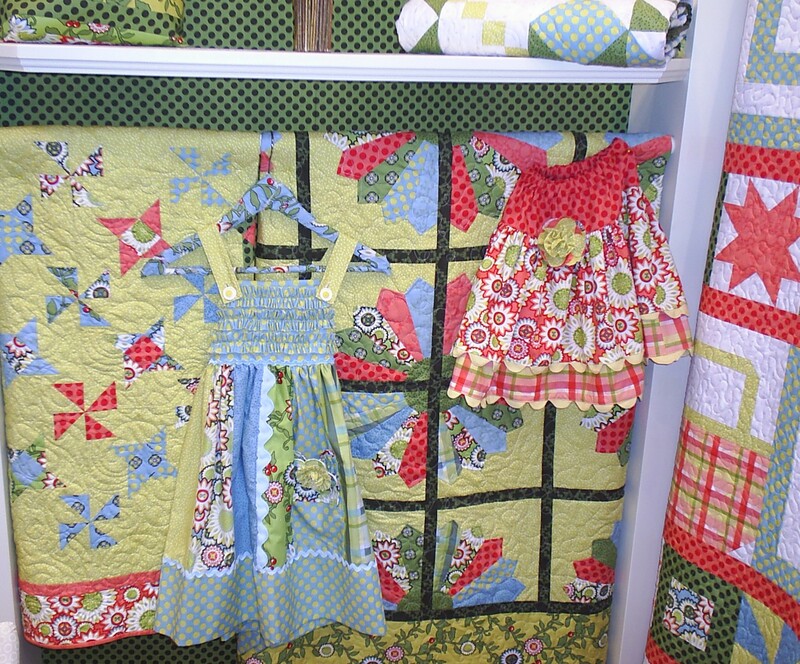 I think it’s great fun to see all the goings on at quilt market–even if we “common folk” can’t go. 🙂 Thanks for giving us a glimpse at all that luscious fabric goodness! I loved seeing your finished quilt in full (sounds like a major kiss-up, I know). Also loved the origami shirts. But I love just seeing all the photos-here goes the fabric budget again! 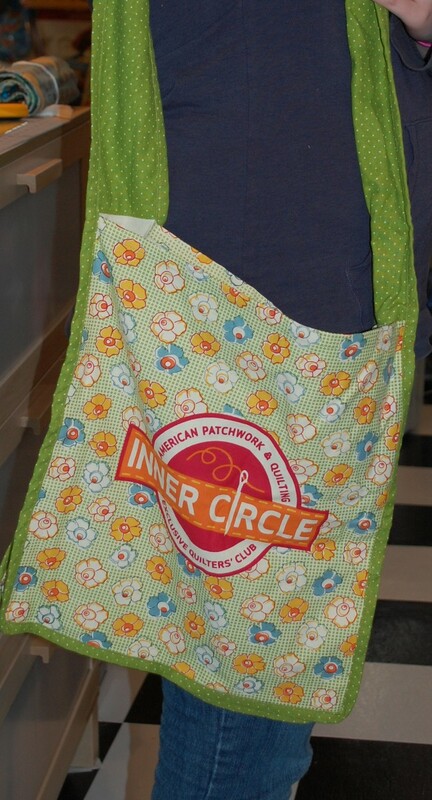 I LOVE the table runner with the circles! Very cute and great colors. THanks for all the great giveaways! I love the shots of Pat Bravo’s booth Scott since I didn’t get as much time to look around that one as I would have liked. It had so many nooks and crannies and fun little “rooms” to look at! The new Art Gallery line is fab. 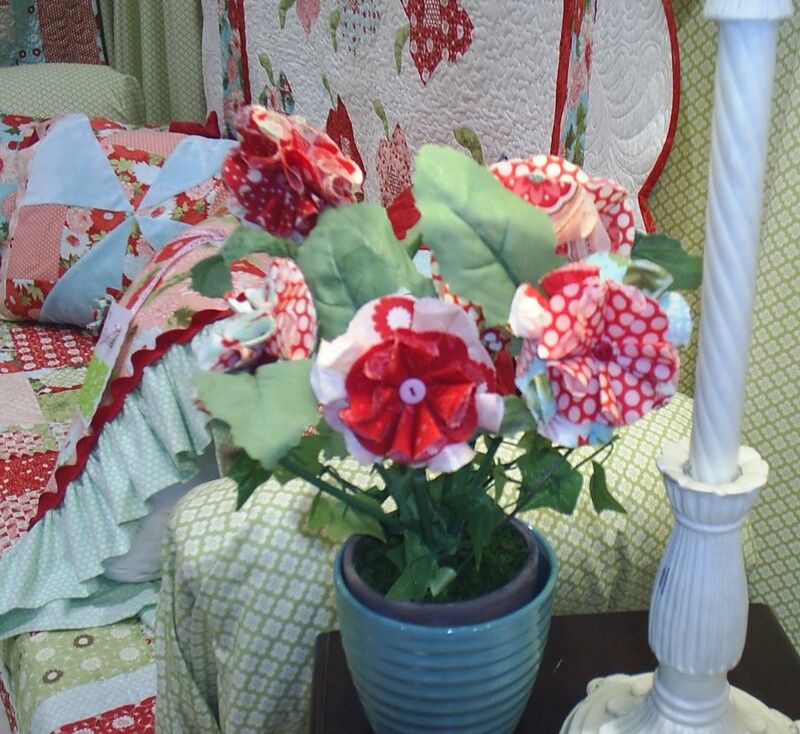 and the fun pillows with 3D flowers are great! Oh you crack me up…one day there will be a post ‘I quit my day job’ and we will be jumping for joy with you…that is what i like about all your posts, your sharing, your creating and just living vicariously through your quilting adventures….can’t wait to see your fabric sculpture that sounds like a cool project! I love that your are sharing your great time! 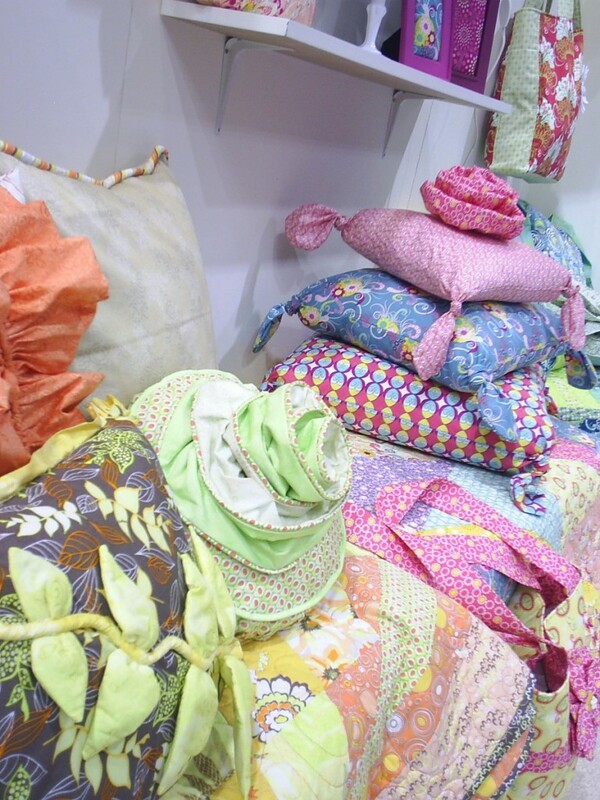 For all of us that really wishes we could have gone to Quilt Market, the beautiful pictures you share are great! And to be sharing the gifts you received as well, that’s just sooo nice! 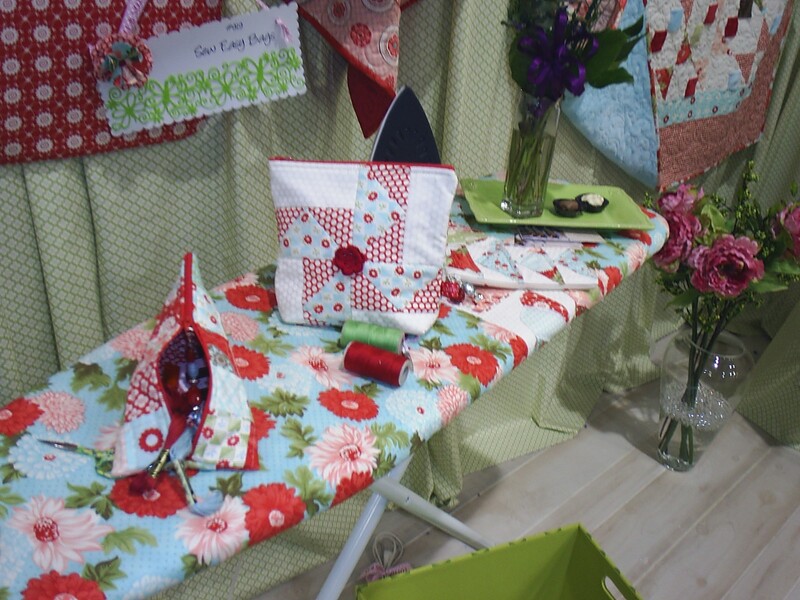 Thanks for sharing all the photos from quilt market. I’ll never get bored of seeing them. 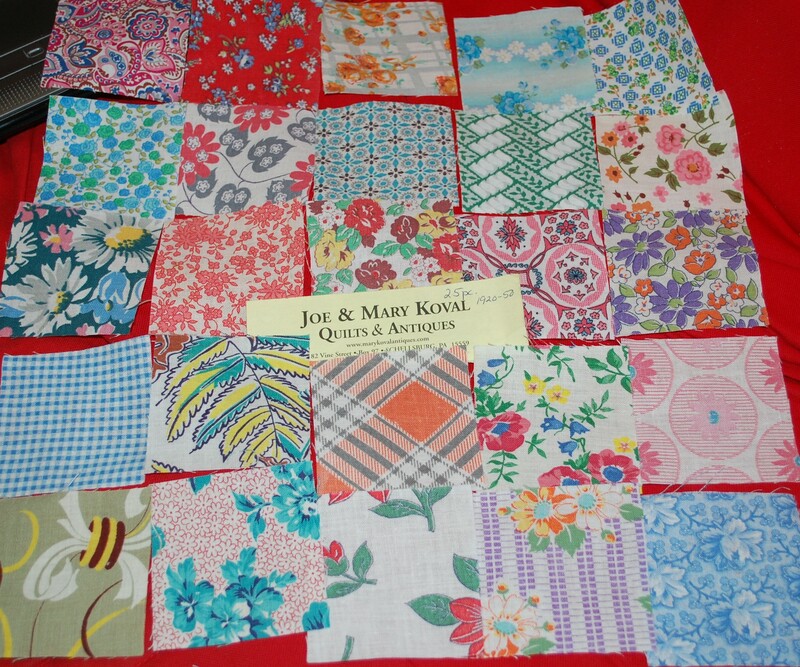 So many beautiful quilts and fabrics!! Great stuff! 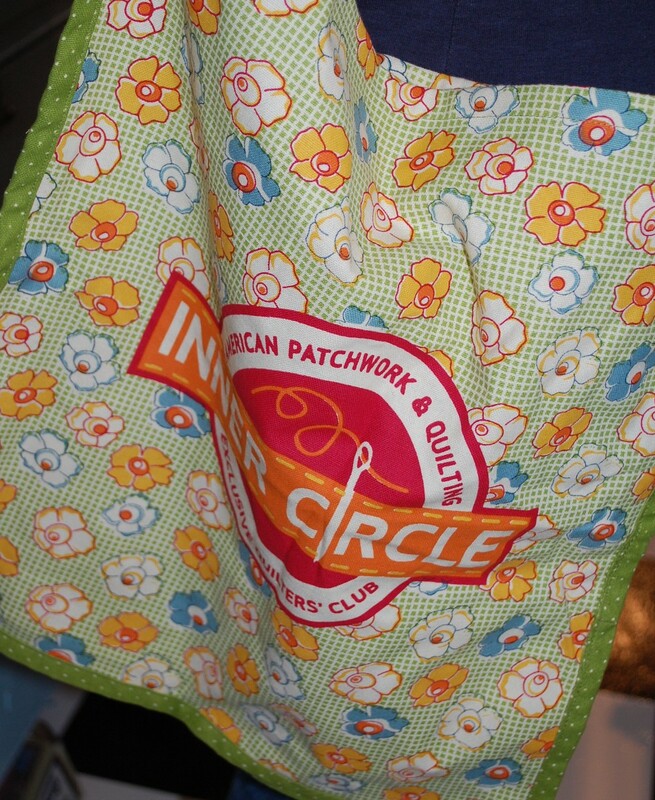 I love table runner in Moda Odyssea – but I’m not sure I would have the patience to applique all those circles and do the scalloped binding … wonderful line of fabric though … Thanks for the updates and the giveaways! Okay Scott, my favorite item in this post is YOUR quilt and then the Odyssea table runner! Your posts are making want to go to Quilt Market so badly! 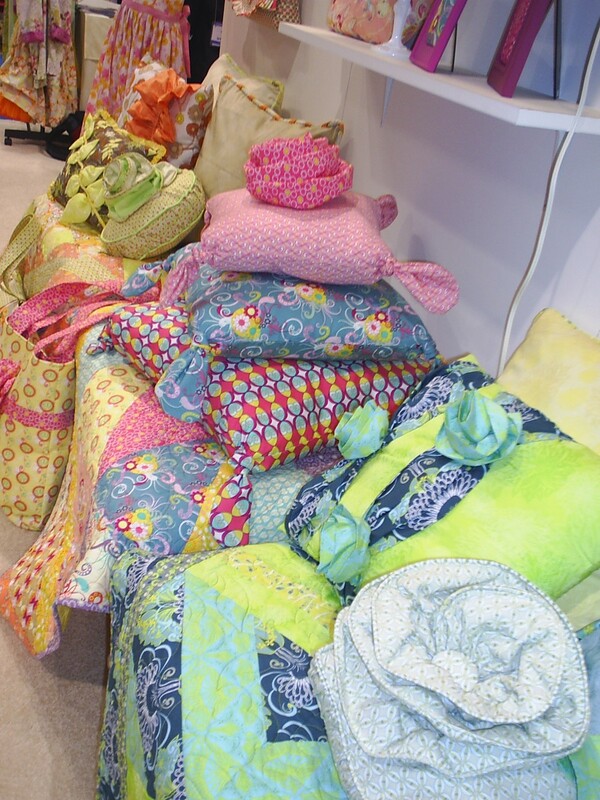 I love Terrie Mangat’s work and her booth is fab… Your quilt looks fantastic with those covered chairs too! Bored. Are you kiddin me? I appreciate you posting the pics of quilt market. Someday I hope to go, but for now you and others like you that share pictures like you do are the only way I get to go!! So keep it up! I think my favorite pic is the ironing board cover. So cute. And no it’s not because I like to iron! Another thing I appreciate is how you took close up pictures. Most people that I’ve seen share pictures take them to try to show the whole booth. Which that is fine, I love that too. But, I always try to zoom in on things I wanna see closer, and then it gets all blurry. So, thanks! And sorry you have to go back to work! What did I like best? I have new bifocals and am still getting used to them, when I scrolled down over your quilt, it kept changing widths sort of like those weird mirros in the fun houses at fairs. Seeing all the different colours being used by the various designers is exciting. I will send my sister your link so she can check your blog and add comments. 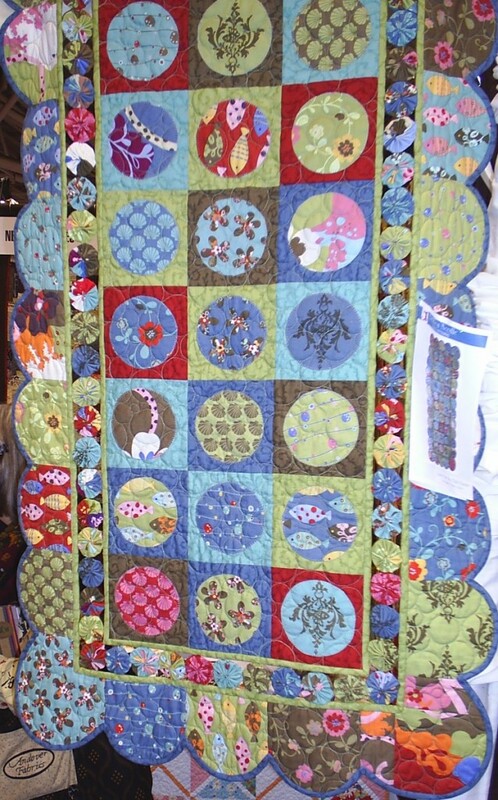 Ohm I love the dresden plate quilt in the Riley Blake photo. It looks life flowers through a window! How neat! Thanks so much for sharing your pictures from market. It is so much fun to see! Your quilt is gorgeous too! 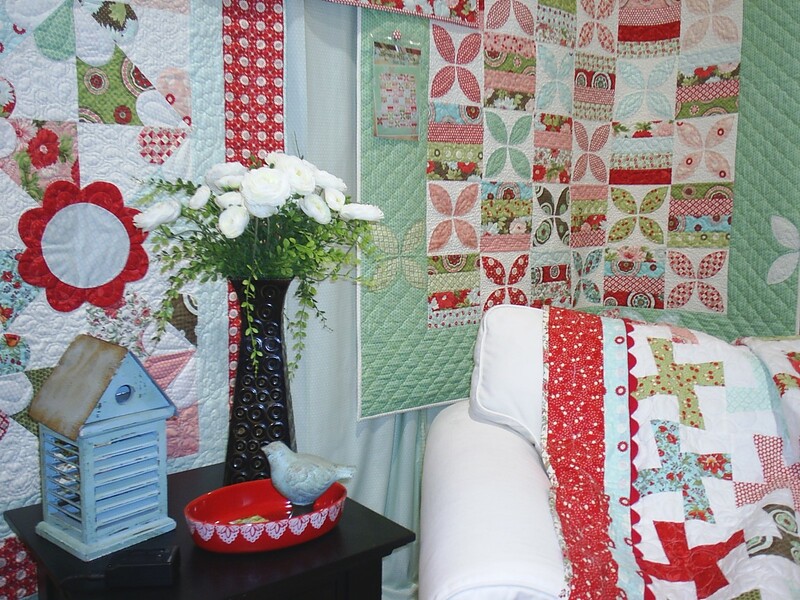 I wish we had quilt market in Australia! Your quilt looked great. Wow, your quilt is STUNNING !! How awesome to see it there IRL.. Your quilt is gorgeous! I also love the quilt with the little shirts. 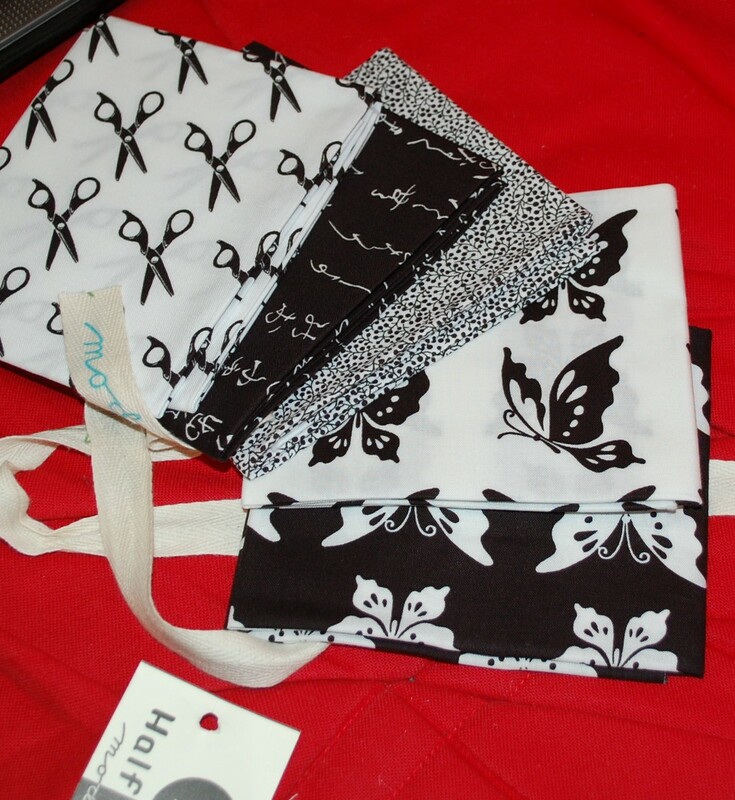 How neat would that be made with scraps from a little boys clothes as a memory quilt! I like seeing the new color trends from all the market pictures. Always something new and exciting. The grass growing in cans in front of your quilt is such an eyecatching detail…some people have all the talent! I love seeing all the pictures from market. My favorite thing is the pillows!! Beautiful. Scott; Love the pics, you’re sharing ones that aren’t showing up in all the other blogs. Thank you. Let’s see, what do I love best…besides yours of course…hmmm, let’s see, well uh, I guess I’d have to narrow it down to Bonnie & Camille or Riley Blake. Love the color combos in both. Koofman does have great fabrics! Another nice giveaway! I love those origami shirts. I need to see if I can figure out how to make them. My husband loves origami, and hawaiian shirts – it would be so fun to make him some of those with hawaiian print fabric or paper! I of course love seeing your Kaufman quilt and esp love the grass in front of it, made it feel like spring. 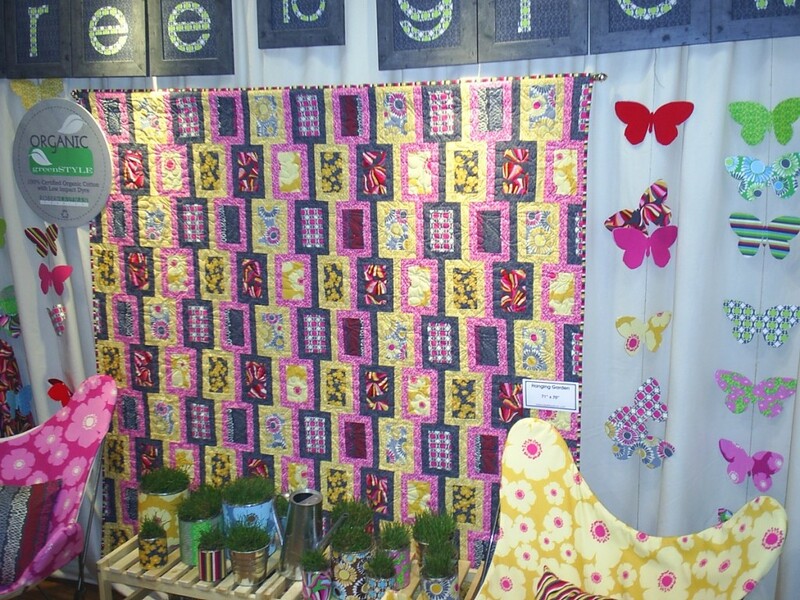 I also loved Terrie’s booth, not a shy color there, it’s vibrant! I think things are unfolding beautifully for you, Scott. I liked seeing your quilt hanging in the booth and seeing Terrie Mangat’s booth. I love her colourful work. Thanks for sharing shots of things that caught your eye and not just traditional booth ‘mug shots’. I enjoy all of the market posts — it’s cool to see what’s coming up. Mostly I like to see the fabrics being used. We just got a new quilting shop in New Orleans (YAY!) but it’s still limited in what she carries. So, I only see fabrics online until I buy them. 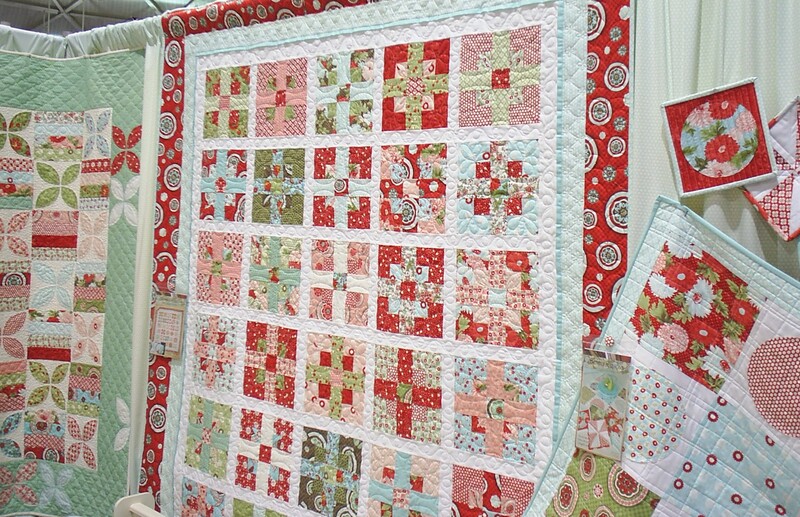 Seeing someone use them in a gorgeous quilt (I really want a tute for the one you made, by the way!) or to make a bag gives me an idea of the scale and colors. I’m also drooling over these giveaways! Thanks for the chance to enter! Thanks for the great giveaway! I don’t know how anybody can pick a fav in this line-up of beautiful fabric goodness, but I’m seriously drawn to Terry Mangat’s fabric, color and more color, you have to LOVE the jewelly (Is that a word?) goodness of it. I don’t know if I could survive being at quilt market. I would probably be the crazy lady trying to sell her wedding ring on the street corner to buy more fabric………by then I know that the plane wants an arm and a leg to take my seriously overweight bags so I could actually cash in my ticket home to buy just a bit more. Then the call to my seriously unhappy hubby to wire me more money to ship the fabric home (duh Kelley) and buy a new plane ticket at an outrageous price with only 3 hours notice! After all that I would be in the “dog house” with all my fabric and there isn’t enough room there for my sewing machine and it’s kind of smelly in there. I love seeing your beautiful photos. I need to find some of Bonnie & Camille’s new aqua & red line. loving it..